Up and coming little rockers – the Magician’s Nephew Band – were not impressed with award-winning artist Finley Quaye borrowing their drums for his own performance. 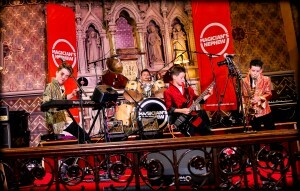 Following Brit and MOBO-award winner Finley Quaye’s reported dramatic booting off the stage at the weekend’s Convent Netgig, the team behind a kids’ rock band from St Albans – the Magician’s Nephew Band – has clarified how their drum kit and logo ended up being used on stage during Quaye’s latest live performance. Quaye’s band failed to turn up for the sound check, arriving six hours late shortly before the gig was due to start. The band also managed to overlook a small detail – they didn’t have a drum kit. Fans were waiting around the venue for some time when event organisers decided to ask for help from the Magician’s Nephew Band who had been booked to perform their own Netgig the next day. Despite being really excited about the fact they were able to help out such a prestigious artist, the boys’ good will gesture backfired as their prominent logo is stuck to the kick drum and after Mr. Quaye being booted off stage went viral on YouTube, national papers and social media, the kids were disappointed with his performance. Fortunately fans waiting to see the gig were able to enjoy the stunning Convent venue and the warm hospitality shown by owners Matt & Charlotte Roberts while the whole ordeal was running in the background. The Magician’s Nephew Band performed on the same stage during lunch time the following day completely oblivious of what had happened the previous night. “It was amazing, they were upbeat and full of energy on stage”. The band also managed to get people dancing while performing their original songs and classic covers. “We had a blast, this is a magical place we want to keep coming back to”, said Euan Campbell, 11, the band’s keyboard player. 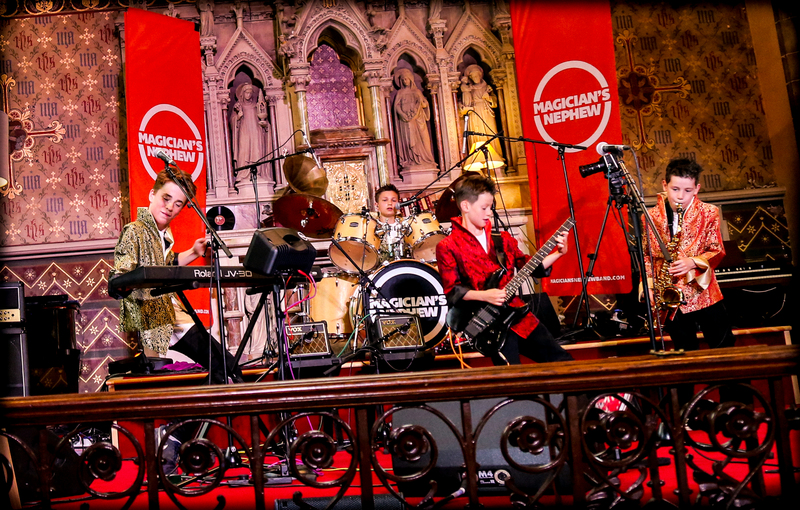 The Magician’s Nephew Band are talented and dedicated songwriters who have emerged from their basement recording studio and are now ready to share their music. So far this year has seen them shake the foundations of the historic St Albans Cathedral and rock the local sweetshop during the filming of their latest video and they are also booked to perform further gigs. They perform an accomplished pic’n’mix of classic rock and roll alongside their own material, leaving audiences tapping their feet. When you have an average age of nine and three quarters they use lyrics that represent all that matters – including Ice Cream, Super Heroes and the dreaded Monday Mornings. Despite the ‘worry-free content’ all of their tracks endorse, don’t be lulled into anything cosy until you’ve experienced the energy, sound and pure talent the Magician’s Nephew Band can deliver. The Band has officially released the latest single “Dinner Lady” which is now available on their website and will be available for download on iTunes and all major digital stores by the end of this month. Visit www.magiciansnephewband.com for more info about the band and to listen to their original tracks. This entry was posted in magicians Nephew Band. Bookmark the permalink.